Le Mazet is within walking distance from Saint Maximin la Saint Baume. You can walk there for fresh croissants in the morning, grab a seat at an outdoor cafe or go shopping. There is a beautiful medieval cathedral. There is a market once a week where you can enjoy all the fresh regional produce. The immediate vicinity offers golfing, horseback riding, cycling, hiking, tennis and kayaking. A day at the beach is another option; the especially picturesque town of Cassis is just 40 km away and is well worth a visit. Le Mazet is in a pleasantly quiet setting on its own enclosed parcel, where you can always find a shady spot for lounging thanks to the lovely old trees. You can cool off in the aboveground swimming pool, where the kids will love to play. You can eat outside on the terrace or inside if you prefer. 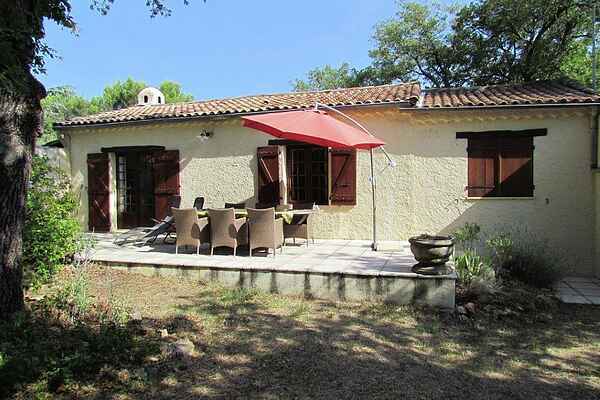 Le Mazet is single-storey and has a living room with French doors that lead to the terrace. The kitchen is fully equipped. There is a master bedroom with a comfortable double bed, as well as a children's room with a bunk bed. These rooms share the bathroom, which has a shower.